Please note: This article is NOT complete. More info and photos will added on a time permitting basis. 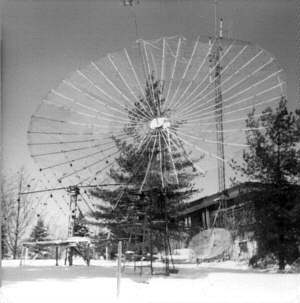 During the mid 1970's K3PGP, using a home-constructed, 24-foot, 0.6-focal-diameter parabolic dish and UHF TV dipole feed-point tuned to channel 68, received KVST-68 Los Angeles (1200 kW ERP) and WBTB-68 Newark New Jersey via moonbounce. At the time of the experiment there were only two known transmitters operating in the United States on UHF television channel 68, the main reason why this channel was selected for EME experiments. Unfortunately this was many years ago. I'll post info here as I find some of my notes from that era or remember more details. 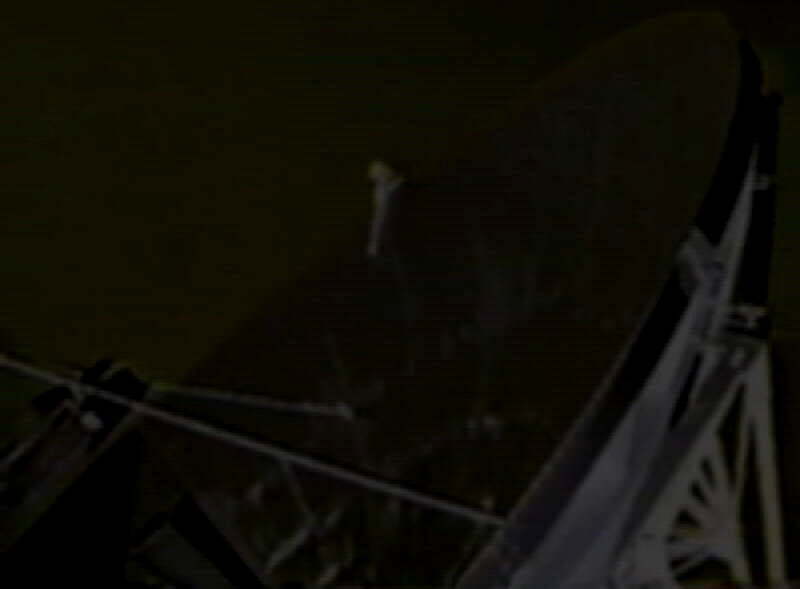 < The homebrew dish antenana used for the experiments is shown at left. The preamp was a homebrew two stage MRF-901 constructed specifically for channel 68 and mounted at the feed of the dish. The feed was a simple dipole and splash plate. I was able to find BOTH the video and audio carriers on both stations! From what I remember the west coast station was stronger. No attempt was made to demodulate the audio as I didn't have an FM receiver with wide enough bandwidth. However, based on what I could hear spashing around in the 2.1 Khz SSB receiver I'd say the audio subcarrier would have produced intelligible but weak audio when the signals were at their peak. I did connect a TV set to the output of the dish mounted preamp (with an additional two stages of MRF-901 in between) and I could at times see distorted black sync bars floating around in the snow but at no time was I able to make anything lock. The pulses looked a bit odd, like they didn't have sharp edges and appeared somewhat wider than what normal sync bars looked like on this TV set. However, they were so weak it was hard to do much analysis. This was the same TV set I used for ham TV on 439.25 Mhz so I had a pretty good idea of what sync pulses looked like when they were very weak and wouldn't lock up. My guess is the pulses were being stretched by the curvature of the moon and further distorted by the rough surface.